Electro-L №1, Russian _hydro-meteorological spacecraft, was launched on geostationary orbit on January 20, 2011 at 12:29 UTC by a Zenit rocket from Tyuratam (Baikonur Cosmodrome), Kazakhstan. Orbit parameters: perigee ~36,000 km, apogee ~36,000 km, latitude 0°, longitude 76°. It is also known as GOMS 2, or Geostationary Operational Meteorological Satellite 2. Electro-L №1 will capture real-time images of clouds and storm systems, collecting weather imagery several times per hour with visible and infrared cameras. The satellite's position in geosynchronous orbit will yield views of the entire Earth disk, allowing its weather sensors to observe storm systems across a wide swath of Asia, the Middle East, and the Indian Ocean. The satellite will also study space weather phenomena and provide communications for search-and-rescue services. The satellite weighs 1,701 kg and will be parked at 76° E longitude. It is expected to function for up to ten years. The initial orbital parameters were period = 1,436.09 minutes, apogee = 35,793.8 km, perigee = 35,779.3 km, inclination = 0.3° on 2011 Mar 30 at 20:01:56 UTC. SKL-E spectrometer has been installed on-board to register energetic particles originated from Earth's radiation belts or from Solar flares. Spectrometer is directed southward, perpendicular to satellite orbit plane. 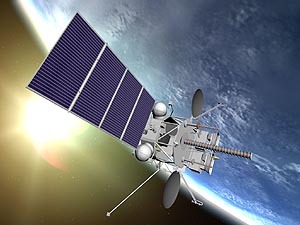 Electro-L, Russian hydro-meteorological spacecraft, was launched on geostationary orbit on January 20, 2011. Orbit parameters: perigee 36,000 km, apogee 36,000 km, latitude 0°, longitude 76°. Calculated energy ranges of registered particles are presented in a Table. 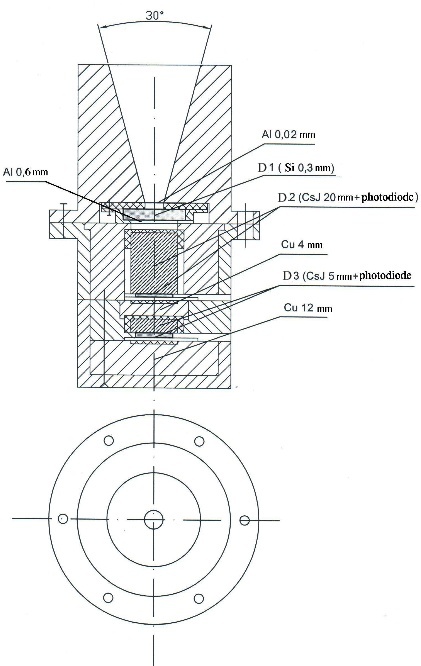 The calculated geometric factor of the spectrometer is G=0.25 cm2·st. ИСЗ «Электро-Л» — Российский космический аппарат гидрометеорологического назначения запущен 20 января 2011 года на геостационарную орбиту (перигей — 36,000 км; апогей — 36,000 км; долгота — 76°; широта — 0°). Значения энергий регистрируемых частиц приведены в таблице. Расчетный геометрический фактор спектрометра СКЛ-Э - G=0.25 см2·стер.